Linen Notepads Printed in Full Color on 70lb White Linen Stock. Padded with 25 or 50 Sheets Per Pad. Printed on 70lb White Linen Stock. Padded with 25 or 50 Sheets per pad. Available in increments 50, 100, 250, 500, and 1000 pads. 1 design only. Sorry No order splitting. Standard production cut off is 12pm eastern time. Need a custom quote please fill out our custom Quote Form. 70lb Linen Notepads: When you want to hand out something customers will use, our 70lb Linen Notepads should be at the top of your list. 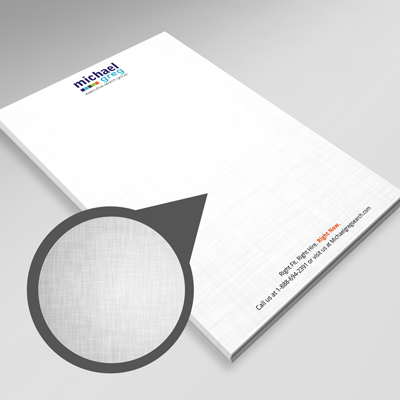 With beautiful full color printing on a rich 10x7 notepad of 70lb Linen paper, your customers will be proud to display your custom notepad on their counter or desk. Available in quantities of 100, 250, 500, and 1000. 4/0 = Full Color 1 Sided. Select the desired number of sheets per notepad. Select a desired turnaround time. Silk Screen T-shirts Printed per Color on Front and/or Back with Choice of Brand and Color T-Shirt. 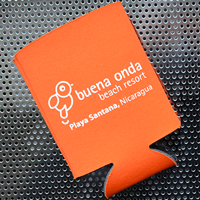 Collapsible Drink Coolies Screen Printed in One Color on a Colored Neoprene Drink Coolie. 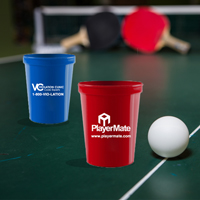 Stadium Cups Screen Printed in One Color on a Colored 16oz Stadium Cup. 30mil Frosted Plastic Cards Printed in Full Color with an Array of Options Including Foil, Spot UV, and Emboss. Silicone Wristbands customized with options including, emboss, deboss, and screen printing on a color silicone band of your choice. 28pt Full Color Foil Business Cards with a Silk Lamination are Printed with an Array of Options Including Foil, Deboss, and Painted Edges. Glitter Gloss Business Cards Printed on 16pt Silk Card Stock with Glitter Added to Areas of Spot UV, Leaving a Raised Glittery Effect. 3D Lenticular Business Cards printed with New Effects like Morph, Zoom, Full Animated, and True 3D Effect.